In spite of all my talking about running, I’ve not actually been out almost three weeks. 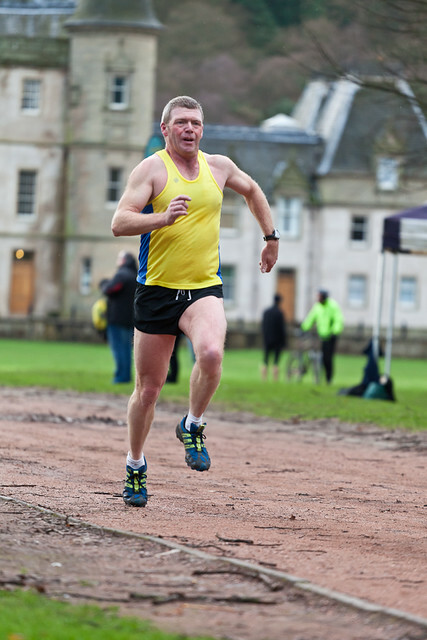 The last time I ran was at the Falkirk Parkrun back on 03-Dec, where I ran okay but afterwards found my lower calves on both legs – but especially my right – quite sore. So, I went out at lunchtime today. Overall, the results were a mixed bag. On the positive side, I got round in what is (for me) a fairly reasonable pace. On the other hand, there is definitely still a niggle in my lower calves / achilles tendons. Update: I’m hobbling around the office like a good ‘un now – something definitely not right. Probably I should be moving around more, rather than sitting stationary in the office. I’m thinking that I may not be running in the Parkrun on Saturday – which at least saves me the trouble of trying to find any fancy dress for running in the pre-Christmas run! 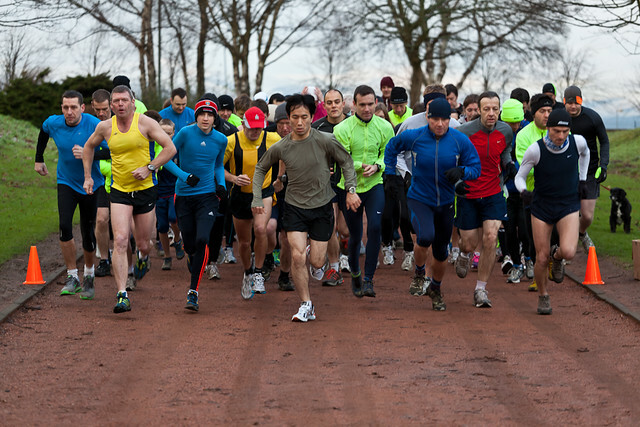 Yesterday I would normally have taken part in the Falkirk Parkrun. Parkruns are great – a free, 5k timed race. To take part, you register at the web site (http://www.parkrun.org) and print yourself a bar code. Then you turn up at your local event, run, and get your bar code scanned. Later on that day, you get a text message or email with your time. Of course, organising these races requires a lot of time, and if you regularly do a parkrun you are asked to volunteer to help out once in a while… and that’s what I was doing yesterday. Finally the winner came through, in a time of 18:10 – a good six minutes faster than I can possibly do! Congratulations to all runners, and I hope to be running next week! Hi, and welcome to my blog. And thank you for reading! My name is Alan; I am a 45 year old husband and father of two living near Falkirk, in Central Scotland. 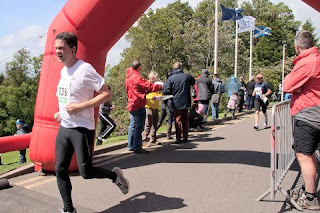 And I have set myself a challenge – I am going to try to run the Edinburgh Marathon on 27th May 2012 – the day before my 46th birthday. This blog will chart my progress. Nobody who knew me from school would ever think that I would do anything like this. I was always averse to any form of exercise; I manipulated the list of subjects I took so as to avoid PE. All the way through University and for many years after starting work, I didn’t do any exercise. But eventually a couple of friendly colleagues – Alistair and Fiona – persuaded me to come out running with them. Those first few runs were an embarrassment… thinking I was doing well getting to the one-mile marker without having to stop, hobbling home after a three mile run thinking I was the bee’s knees. Alan finishing the Dunblane 7.5 mile race on May 2011. 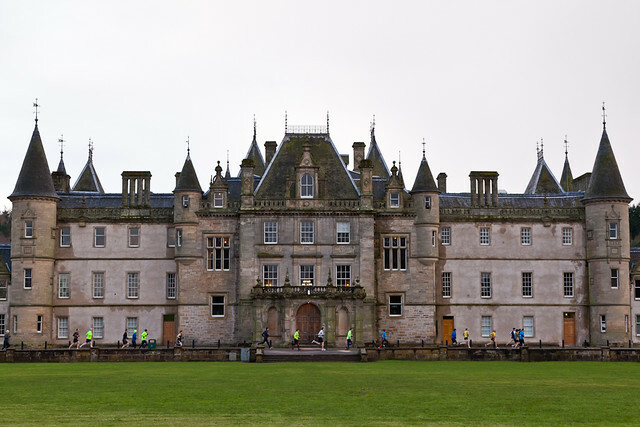 Eventually, Alistair started talking about trying the Linlithgow 10k. On the application form, I put my target as “finishing alive”. I loved the excitement and the experience of the event, until I hit the hill at kilometre seven… that one finished me! But I did complete in under 55 minutes, and was proud of myself. Since then I have run a few 10ks, but in 2011 I completed my first ever half marathon. This was the Great Scottish Run in Glasgow, and what an event it was! People cheering you on all the way, kind folk passing out fruit and sweeties to the runners. Even a group of folk setting up an unofficial water station, under the banner “Sikhs In The Community”! Wonderful. But even as I crossed the line, in the somewhat frustrating time of 2:00:09, I knew that this was a half marathon. Seriously, running for thirteen miles should never be called a “half” of anything! So… there was an obvious conclusion. I had to run a full marathon.